Almost every teen looks forward to getting his driver’s license and owning his first car – whether new or old. A male teen especially, would wish for a brand new sports car. A Mustang perhaps? Maybe a Porsche? How about a Jag? A Corvette is it! You’d hear most teens make their wishes made known, as if dollars grow on trees. “My Dad is going to give me a Corvette when I turn 16.” Jeremy, my neighbor’s son, told me when he turned 13. And on his sixteenth Christmas, he got one! Parents do cater to their teen’s wishes and surprise them with that most coveted gift for Christmas. Something about that smile on your son’s or your daughter’s face when they see the big surprise – you wish to remember forever. As a parent, I was one of them. When my oldest son, Cliff, turned 17, I gave up my art winnings to buy him a Camaro for Christmas. Though it was not brand new, it sparkled like one. How about teens who could never have the luxury of owning a vehicle? Teens in countries like the Philippines. Two months ago I wrote about Dorel, the young man who was born without legs. Dorel told about his excitement when someone gave him a wheelchair at 16. To Dorel, it was like getting a sports car for Christmas. With his “new wheels,” he was able to go wherever he wanted to go. Dorel’s story touched people’s hearts; a couple of people sent support so he could continue his studies. But someone saw a different way to give Dorel happiness. This person who wishes to be anonymous sent me funds to buy Dorel a new set of wheels – an electric scooter!”I wish for Dorel to have electric legs for Christmas!” The donor said. Right away I thought of how to give Dorel his big surprise. I called Pastor Reuben in Manila to scout for an electric scooter. A few days later, we decided on a Japan made, “heavy duty” red scooter. “Don’t tell Dorel that I’m going to deliver the scooter. I want to surprise him. I want to capture his reaction with my video camera,” Pastor Reuben said. Taking the newly purchased red scooter, Pastor Reuben traveled to Bacolod, Negros by ship. The following day, he reached the island and proceeded to Central Philippine Adventist College, Dorel’s school. Reuben watched Dorel roll the wheels of his wheelchair with his hands. As soon as Dorel got close to the cafeteria, Pastor Reuben slowly walked toward Dorel. “Are you Dorel?” Pastor Reuben asked. “Yes, I am.” The young man answered, a little hesitant at first. “I have a present for you. It came from someone in America,” Pastor Reuben said. day he shared his story through e-mail. And now, a brand new scooter will replace his old wheelchair! He remembered his tough times growing up a handicap in an orphanage. By this time, students and teachers started gathering around. They watched and cheered Dorel as he nervously got into the scooter and tried it for a spin. All the while, Pastor Reuben had his video camera rolling. “Dorel had tears in his eyes, and I did, too,” Pastor Reuben told me on the phone. 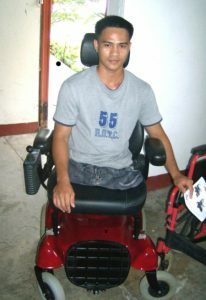 Dorel is so grateful to the thoughtful folks who sent funds for his schooling and to the anonymous donor who gave him new “electric” legs.